Fortified town, situated in a province of the same name, in northern Italy, and founded, in 1168, by citizens from Cremona, Milan, and Piacenza. 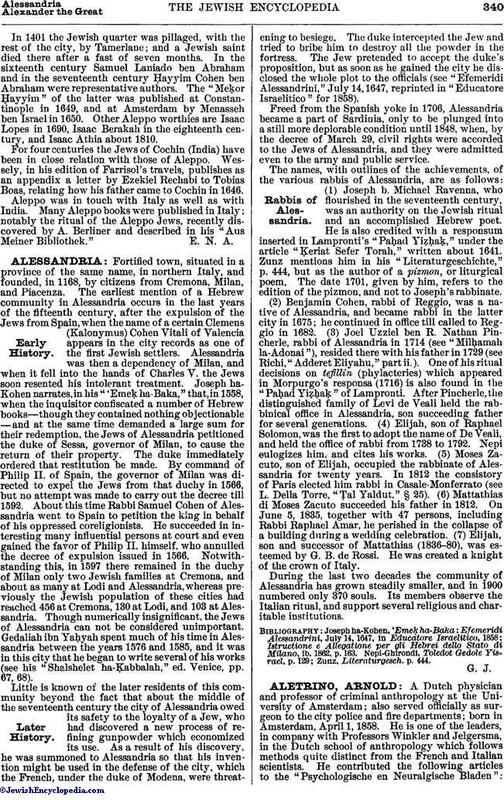 The earliest mention of a Hebrew community in Alessandria occurs in the last years of the fifteenth century, after the expulsion of the Jews from Spain, when the name of a certain Clemens (Kalonymus) Cohen Vitali of Valencia appears in the city records as one of the first Jewish settlers. Alessandria was then a dependency of Milan, and when it fell into the hands of Charles V. the Jews soon resented his intolerant treatment. Joseph ha-Kohen narrates, in his "'EmeḲ ha-Baka," that, in 1558, when the inquisitor confiscated a number of Hebrew books—though they contained nothing objectionable—and at the same time demanded a large sum for their redemption, the Jews of Alessandria petitioned the duke of Sessa, governor of Milan, to cause the return of their property. The duke immediately ordered that restitution be made. By command of Philip II. of Spain, the governor of Milan was directed to expel the Jews from that duchy in 1566, but no attempt was made to carry out the decree till 1592. About this time Rabbi Samuel Cohen of Alessandria went to Spain to petition the king in behalf of his oppressed coreligionists. He succeeded in interesting many influential persons at court and even gained the favor of Philip II. himself, who annulled the decree of expulsion issued in 1566. Notwithstanding this, in 1597 there remained in the duchy of Milan only two Jewish families at Cremona, and about as many at Lodi and Alessandria, whereas previously the Jewish population of these cities had reached 456 at Cremona, 130 at Lodi, and 103 at Alessandria. Though numerically insignificant, the Jews of Alessandria can not be considered unimportant. Gedaliah ibn Yaḥyah spent much of his time in Alessandria between the years 1576 and 1585, and it was in this city that he began to write several of his works (see his "Shalshelet ha-ḳabbalah," ed. Venice, pp. 67, 68). Little is known of the later residents of this community beyond the fact that about the middle of the seventeenth century the city of Alessandria owed its safety to the loyalty of a Jew, who had discovered a new process of refining gunpowder which economized its use. As a result of his discovery, he was summoned to Alessandria so that his invention might be used in the defense of the city, which the French, under the duke of Modena, were threatening to besiege. The duke intercepted the Jew and tried to bribe him to destroy all the powder in the fortress. The Jew pretended to accept the duke's proposition, but as soon as he gained the city he disclosed the whole plot to the officials (see "Efemeridi Alessandrini," July 14, 1647, reprinted in "Educatore Israelitico" for 1858). Freed from the Spanish yoke in 1706, Alessandria became a part of Sardinia, only to be plunged into a still more deplorable condition until 1848, when, by the decree of March 29, civil rights were accorded to the Jews of Alessandria, and they were admitted even to the army and public service. The names, with outlines of the achievements, of the various rabbis of Alessandria, are as follows: (1) Joseph b. Michael Ravenna, who flourished in the seventeenth century, was an authority on the Jewish ritual and an accomplished Hebrew poet. He is also credited with a responsum inserted in Lampronti's "Paḥad YiẓḥaḲ," under the article "ḳeriat Sefer Torah," written about 1641. Zunz mentions him in his "Literaturgeschichte," p. 444, but as the author of a pizmon, or liturgical poem. The date 1701, given by him, refers to the edition of the pizmon, and not to Joseph's rabbinate. (2) Benjamin Cohen, rabbi of Reggio, was a native of Alessandria, and became rabbi in the latter city in 1675; he continued in office till called to Reggio in 1682. (3) Joel Uzziel ben R. Nathan Pincherle, rabbi of Alessandria in 1714 (see "Milḥamah la-Adonai"), resided there with his father in 1729 (see Richi, "Adderet Eliyahu," part ii.). One of his ritual decisions on tefillin (phylacteries) which appeared in Morpurgo's responsa (1716) is also found in the "Paḥad YiẓḥaḲ" of Lampronti. After Pincherle, the distinguished family of Levi de Veali held the rabbinical office in Alessandria, son succeeding father for several generations. (4) Elijah, son of Raphael Solomon, was the first to adopt the name of De Veali, and held the office of rabbi from 1738 to 1792. Nepi eulogizes him, and cites his works. (5) Moses Zacuto, son of Elijah, occupied the rabbinate of Alessandria for twenty years. In 1812 the consistory of Paris elected him rabbi in Casale-Monferrato (see L. Della Torre, "Ṭal Yaldut," § 25). (6) Mattathias di Moses Zacuto succeeded his father in 1812. On June 5, 1835, together with 47 persons, including Rabbi Raphael Amar, he perished in the collapse of a building during a wedding celebration. (7) Elijah, son and successor of Mattathias (1836-80), was esteemed by G. B. de Rossi. He was created a knight of the crown of Italy. During the last two decades the community of Alessandria has grown steadily smaller, and in 1900 numbered only 370 souls. Its members observe the Italian ritual, and support several religious and charitable institutions.